Hanoi (VNA) - The Vietnam News Agency (VNA) and press agencies of Cuba have agreed to expand their bilateral cooperation in specific fields to match with the current demand of each side. 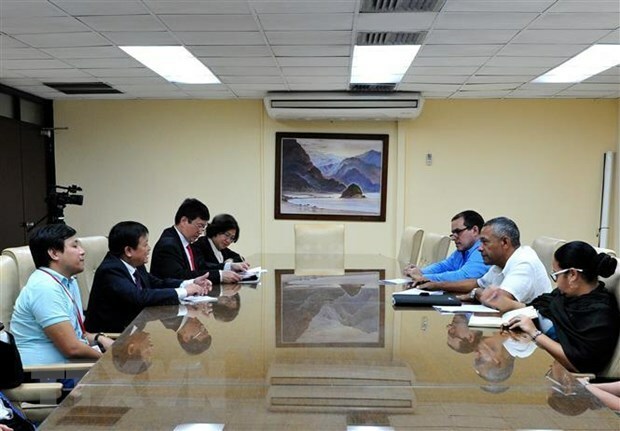 The consensus was reached at working sessions between the VNA delegation led by Deputy General Director Dinh Dang Quang and representatives of Cuban news agencies Prensa Latina and ACN in the framework of their visit to the Caribbean island country on April 10-11. In the meeting with Head of the Communist Party of Cuba Central Committee’s Ideological Department Angel Arzuaga, Quang briefed the host on the cooperation results between the VNA and the Cuban news agencies and upcoming plans to promote cooperation in specific fields. Arzuaga said the cooperation between the VNA and the Cuban news agencies is a vivid symbol of special solidarity between the two Parties and States, affirming that the Communist Party of Cuba always supports steps aiming to further tighten the cooperation and friendship between comrades in the cause of revolutionary jounalism. At the talks with the VNA delegation, Prensa Latina (PL) President Luis Enrique Gonzalez Acosta highlighted the importance of traditional cooperation between the two news agencies, and thanked the VNA for its regular assistance in the past years. For his part, Quang appreciated the PL’s role in helping Vietnamese people accurately understand the situation in Cuba and the Latin America region, as well as coordination of the Cuban news agency to introduce the VNA’s Vietnam Pictorial publication to readers in Latin America. The two sides showed their satisfaction with the results in the exchange of information in text, photo and television formats. They agreed to push the publishing of the Spanish-version of the Vietnam Pictorial, thus broadly introducing the Vietnam Government’s official newspaper for foreign services in Cuba and in the Latin American region in general. During their stay, the VNA delegation also had a working session with leaders of the Cuban domestic news agency (ACN), and presented it with a number of equipment for press activities. ACN Director Edda Diz Garces highlighted the relations between the two agencies, and thanked the VNA for its effective support and assistance.